Medicare Part A and Medicare Part B are required if you want to apply for a Medicare Supplement policy. When you have both Medicare Parts A and B it is commonly known as Original or Traditional Medicare. For Americans over the age of 65, Medicare Part A and Part B form the core of their healthcare. Medicare is one of the best healthcare systems in the world. Medicare Part A is the first part of Medicare. It is free and is mostly in-patient Hospital Coverage. Medicare Part B is the second part; it helps cover outpatient treatments. The services fall into two categories, (1) Medically necessary services, such as treatments required to diagnose and treat accepted medical conditions. (2) Preventative services to help prevent illnesses, like flu shots, or to detect conditions at an early stage like prostate cancer screenings or mammograms. However, Medicare Part B is not designed for long term care, dental issues, routine foot care, hearing devices, or eye exams to name a few. Who is Eligible for Medicare Part B? Take a moment and learn about Medicare Supplement. What is the Cost of Medicare Part B? Although Medicare is administered by the government, it comes at a small price. Most Americans pay a monthly cost of $135.50. However, some people who are Medicaid eligible may get it for free. And some higher income individuals will pay higher rates for their Part B. Once you enroll in Medicare, a review of your last two years tax returns will be used to determine the cost of your Part B. The standard Part B premium amount in 2019 is $135.50 and most people will pay the standard Part B premium amount. 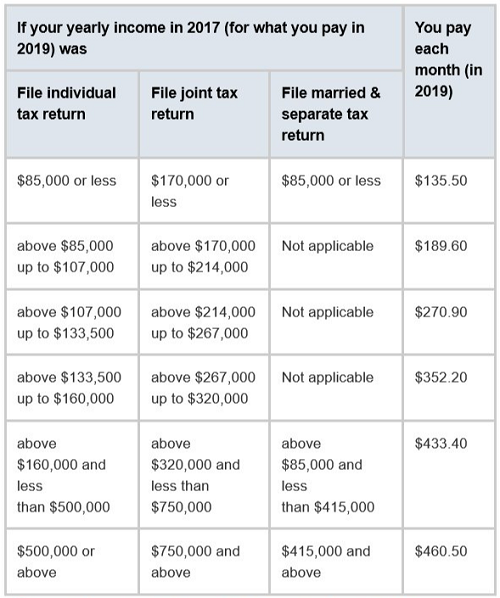 If your modified adjusted gross income as reported on your IRS tax return from 2 years ago is above a certain amount, you’ll pay the standard premium amount and an Income Related Monthly Adjustment Amount (IRMAA). IRMAA is an extra charge added to your premium. Medicare Part B has a deductible and co-insurance. Each person must meet the $185 per year deductible. This is a calendar year deductible. After deductible Medicare Covers 80% in most cases, leaving the patient with 20% of the cost. Enrollment in Part B is easy. Often times it will automatically process or you could visit Medicare.gov to enroll online. It is very common today that a person’s Part A and Part B both automatically begin on the 1st day of one’s 65th birth month. So if a person turns 65 on June 7th, their Part A and Part B would begin June 1st. If you have questions about Part B enrollment and want to learn more about Medicare it is best to let us provide you with a Medicare Overview. Very happy with QuoteFinder. First call was ten minutes and it lead to great clarity. The booklet sent to me by the Federal Gov. was confusing. Speaking with a real person was much easier.